Maria del Carmen Llamas thanks the Pharr-San Juan-Alamo Independent School District for providing internet into her home for her grandchild Friday May 12, 2017 at Cesar Chavez Elementary School in Pharr. The City of Pharr announced a pilot program that will provide 50 families with internet service for children who attend PSJA schools. 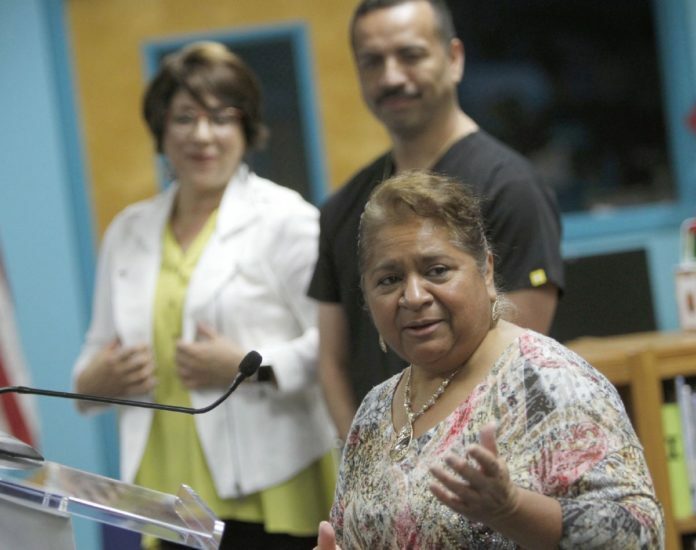 PHARR — Fifty residents are set to receive digital services this month with the launch of a pilot project called Pharr Life Net that will bring free internet to selected families on the south side of town. The project, announced at a news conference Friday, is a collaboration among public entities such the city of Pharr, the Pharr-San Juan-Alamo school district and the Federal Reserve Bank of Dallas, and private entities like BBVA Compass bank, which was an early supporter of this collaborative initiative. The Dallas-based Fed worked with the city and school district for about six-and-a-half months to conduct research, planning and execution of the service for those who can’t afford access to broadband internet. The pilot program is being launched in the Dicker Road/Thomas Road area. “The residents were chosen based on the need and vulnerability,” said Dr. Ambrosio Hernandez, Pharr mayor. By having access to the internet, PSJA students in the program will have network capability to interact in new educational programs, representatives said. An additional 250 homes will receive broadband internet in the coming months through the Pharr Life system. The service, administered through the City of Pharr Innovation & Technology department, is part of the city’s ongoing efforts to offer free wifi in and around city buildings, and to offer internet access to resident at little to no direct cost.